This is the text of our response to Hertfordshire County Council’s A414 corridor strategy. Note that we are only commenting on the sections covering Welwyn Hatfield. Do please add your own comments to HCC’s site and please let us know what you said. We are pleased to see the strategy recognises the need to prioritise active travel. However, we appreciate that any meaningful change cannot happen without sufficient funding. Also, the county cannot go on building more homes and putting more cars on the road without risking extreme congestion. We believe it is essential therefore that Hertfordshire County Council bring in a workplace parking levy to ensure it has the funds to implement effective alternative transport systems. With levy funds dedicated to transport, prioritising gaps in cycling connectivity, particularly at dangerous junctions, then becomes possible, as does the lighting and adequate maintenance of interurban routes. All major cycle routes must be off road not lanes on road with painted lines which are driven over or parked on. Only when there are high standard safe connecting routes linking people to key destinations such as schools and stations will we actually see any real change. Please remember the law requires 11 year olds to ride on the road, all cyclists, including children, being legally required to ride on the road where there is no off road cycle path. In our response below we comment on concerns with the overall strategy, the mass rapid transit system and rail links and then a section by section critique of existing infrastructure. There is so much which needs to be done. The question is will Hertfordshire meet the challenge or will this be another report leading to little action? Priority for active travel: We are pleased there is a recognition that there is poor connectivity for cyclists. The plan has to give priority for active travel (walking and cycling) in the corridor otherwise nothing will change. HCC acknowledges that its Local Transport Plans 1-3 have failed to achieve any modal shift. We fear that five years from now little will have changed given population growth in the county and continued very limited investment in non-motorised travel. Children: We are particularly concerned that the lack of safe cycle routes means parents will not let children cycle to school, a solution to the school run, creating generation after generation of adults who never saw cycling as a means of transport. Eleven year old children are legally required to ride on the road where there is no off road cycle path. The contrast with the Netherlands, Denmark and Germany is stark. New housing: Where new housing developments happen along the corridor the cycling links from these developments to key destinations such as town centres, stations and schools must be funded and constructed first to enable good habits as soon as homes are occupied. 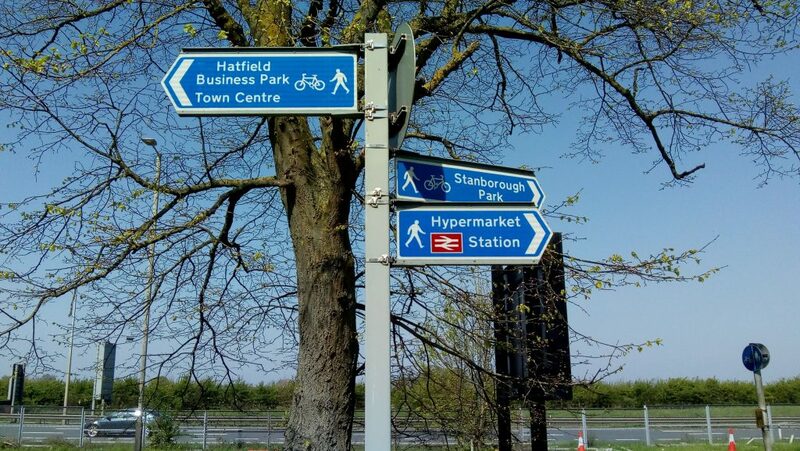 For example, we are still waiting for the safe cycle route from Hatfield Business Park to Hatfield Station 19 years after it should have been completed. Signs: Where changes are planned to signs, please consider signing with cycling journey time to show how quick routes are (e.g. Hatfield to St Albans is 35 minutes). In our experience drivers grossly over estimate cycling times based on miles. Town centres need maps showing where a 5 minute or 10 minute ride will take someone. Hatfield has this, but only for walking. Junctions: A common thread in the detail below is where current cycle routes cross main roads at informal junctions which are effectively unusable at peak traffic times, the only chance to cross the road being when a driver stops (rare) or risking running between moving cars. Unless these are fixed, there is effectively no cycle route at all. Cycle lanes and cycle routes: There is confusion with terminology in the document: A cycle lane implies an on-road lane marked only with paint. This is normally a poor solution as cars do not respect them and they are driven or parked on. If the plan means an off-road cycle path it needs to make this clear. We have indicated where this is not clear to us. Funding: The key problem for Hertfordshire is funding this work given the reduction in government funding for local authorities. We endorse recent suggestions that councils use workplace parking levies to fund transport, as successfully done in Nottingham. This does not reduce provision for cycling by taking away existing routes. The MRT vehicles are able to take bicycles of a variety of shapes and designs to enable the MRT to form part of a journey. For example, a disabled tricycle rider who cycles to the MRT in Hatfield, takes the MRT to Watford and then cycles on to their destination. For example, Edinburgh allows bicycles on their trams at off peak times. Cape Town allows bikes on local buses. Easy access to the MRT interchanges and extensive secure cycle parking are needed as an integrated part of the plan, not an after-thought. There is no off-road cycle access to Welwyn North station and no cycle route from Welwyn or Woolmer Green to the station (or indeed to/from Monks Walk school). A cycle route next to the A1000 across A1(M) junction 6 is much needed, extending north alongside the B197. Welwyn Garden City station only has off road cycling access to the east side. On the town side cyclists are expected to mix with cars and taxis making for difficult access. Hatfield station access is the best in the area, having vastly better cycling access in the immediate area, but curiously no direct cycle link to Old Hatfield. This could easily be achieved via an existing subway. Welham Green has no cycle route to the station. 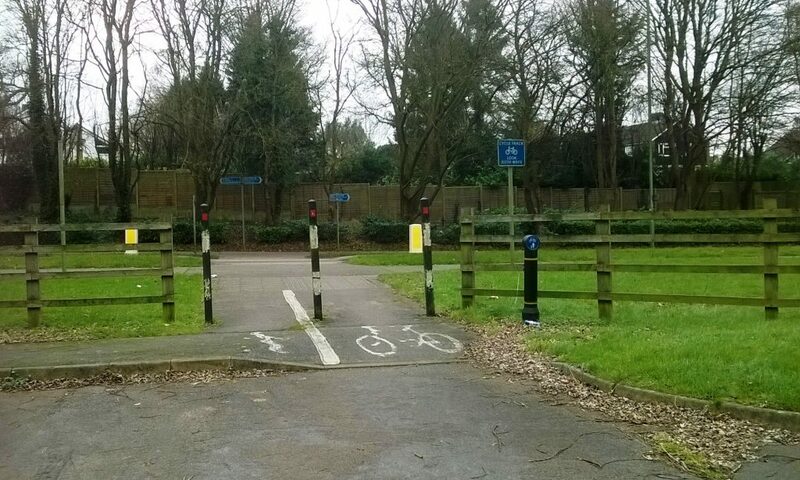 Access from residential areas via Huggins Lane into Travellers Close (and thence Travellers Lane to the station) is blocked by a line of bollards with no gap in the kerb for cyclists. This is a very simple change which could make a big difference. Brookmans Park has no safe cycle routes at all, yet there is demand from parents for a safe cycle route to Chancellor’s School. The junction of the A414 with the A1081 is extremely hostile to cyclists and pedestrians, there being no safe crossing of the north side of the roundabout. This makes the cycle path along the A414 unusable. A light controlled crossing here for cyclists and pedestrians is essential. It is very disappointing to note that this issue noted as a fault 5 years ago, yet the traffic lights were recently upgraded and no cycle crossing was added. At the Colney Heath long-about, traffic turning off into Smallford Lane does so at speed, with signalling frequently left until the last moment. There is no means for walkers and cyclists to control this dangerous junction. This also makes this section unusable at peak times. The footbridge over the junction with narrow paths and tight corners is unusable for disabled cyclists in tricycles and almost impassable for tandems, often used by couples with a disabled rider at the rear. We are pleased this is noted in the plan. There are several bridle path crossings of the A414 which are incompatible with traffic speeds and need replacing by bridges or light controlled crossings lest they be effectively unusable. 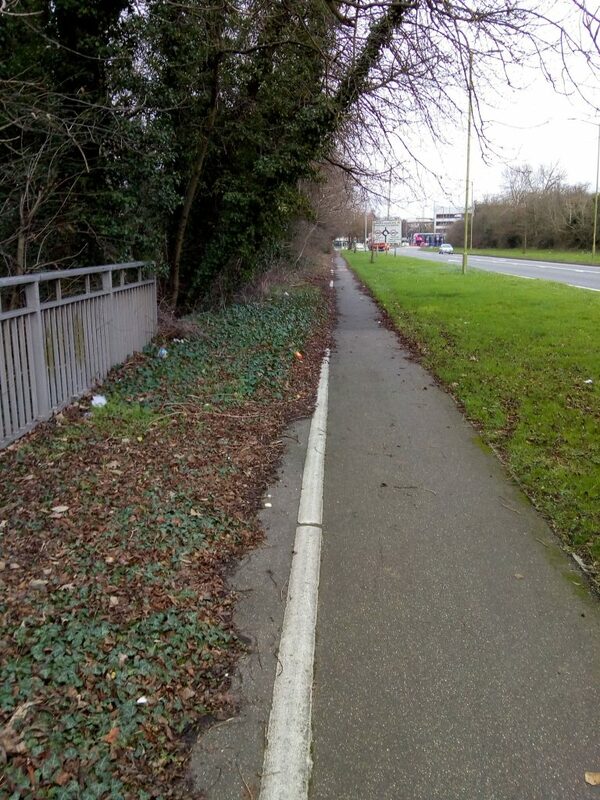 The A414 cycle path east to Hatfield is overgrown and badly maintained with tree root damage. This suggests HCC does not really care about cycling along this corridor. There is no direct lit cycle route from St Albans to Hatfield. This will inevitably mean reduced use October to March, which is a key time for schools and colleges. The A414 is a long way around. The plan calls for an “enhanced” Alban Way. The key improvement require is that it should be lit for its whole length, with work to cut back trees and bushes to improve feelings of safety. Tree root damage should be repaired and a regular maintenance program be set up. It needs connecting to the industrial sites around Acrewood Way as the existing muddy paths are inadequate (and not legal cycle routes). Where the Alban Way passes under Cavendish Way, on the north side of the subway is a very dark section where bush growth blocks the lighting. There is a very real risk of collision here as cycles leave a brightly lit (but badly graffitied subway) and exit into a black void. The section along the Galleria Wall is a secluded hang out for drug taking and disposal of stolen goods from the Galleria. It need vegetation cutting back and sightlines opening up. There should be a lit off-road cycle path alongside the A1057 from the University at least to Oaklands college getting cyclists off the higher speed section of road to encourage cycling to the college. At Fleetville off-road provision is required given traffic to and from Morrisons and/or a 20 mph zone enforced with speed cameras. We support the plan to provide a cycling and walking route along Coopers Green Lane and to reduce the speed on this road. We support the plan to replace the Ellenbrook roundabout with a light controlled cross roads so long as there is a separate walking and cycling phase and a safe cycling route north south across the junction linking to existing cycle paths, not an on-road solution. Lighting the whole of the Alban Way should be a quick win project for this section using solar studs to enable speedy installation and cost-free lighting, avoiding the disruption and cost of lighting columns and power cables. We support the plan for a bridge over the A1(M) which we assume is the proposed link between the university campuses. However, as this will be very expensive to implement, improving the junction of the A1001/A1057 to the west of the Galleria to allow single phase crossing rather than existing four phases, would be a quicker way to improve inter campus links. Cycling north alongside the A1001 at this junction the choice is either 6 phases to cross going east (2 phases), north (2) and then west (2) as there is no direct northbound link. Alternatively, you have to go west to the University and then cross north (2) and then east (2) and then negotiate the conflicted site where the cycle route goes through the bus stop, an appallingly poor section of route. The existing shared use path is badly affected by tree roots alongside Pond Croft. This section needs resurfacing. We support signalising the Bishops Rise junction so long as there is a separate walking and cycling phase. This should include direct diagonal crossing as provided outside Hatfield station. Bus lane: We support a bus lane so long as this does not reduce off-road cycle path provision. The proposed zebra crossing at Meadow Dell should be a Tiger crossing allowing use by cyclists and linked to Aldeykes to improve cycle routes in to this housing area. It is no good providing cycle routes people cannot access across busy roads. The proposed cycle route along Roehyde Way to the University park and ride is supported. It should then go on along South Way to the spiral bridge to join national route 12 to Welham Green and Brookmans Park. An off-road cycle route along Queensway from the Swim Centre to French Horn Lane is a vital missing section of route. 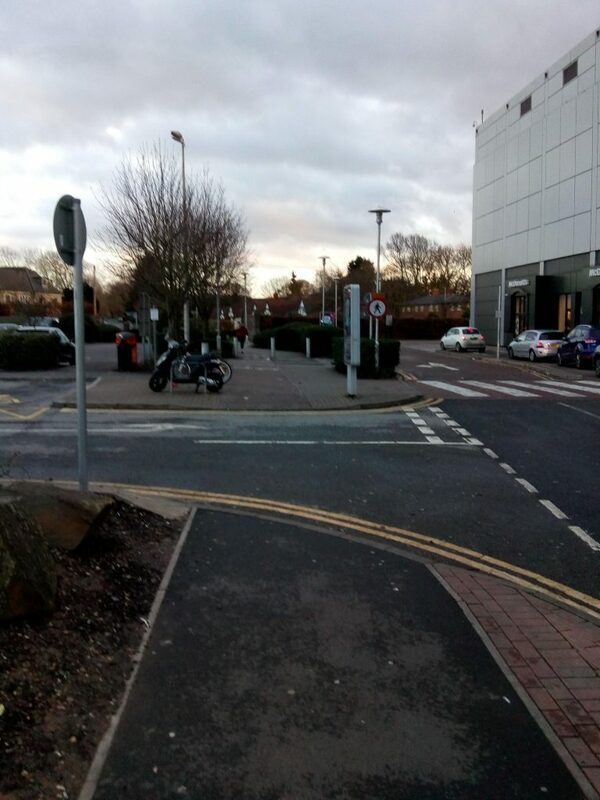 The existing on-road cycle lane only starts north of Lemsford Road, is then crossed by Asda traffic (north) and buses (south) which is intimidating and often dangerous. The Woods Ave roundabout has a terrible cycle path placing right turning cyclists to the left of left turning cars. This whole section needs replacing urgently. We support traffic calming on Link Drive. The road could be much narrower than it is, which could then free space for a cycle path to Breaks Manor and Onslow School. The pedestrian subways under Queensway should not be considered as an acceptable alternative to signalised surface crossing points. They cannot be used by cyclists and are disliked by pedestrians given anti-social behaviour. Please close them. We support the Hatfield 2030+ vision that this road will be reduced to 2 lane and the roundabouts replaced with simple light-controlled junctions. There is still no off-road cycle route between French Horn Lane and Wellfield Road. This could be easily constructed along the alignments of former roads in the town centre connecting to a crossing of Queensway at the north end of the town, which would then open up the shops to people commuting to and from the station. An off-road cycle route around the Queensway / French Horn Lane roundabout is need as this is a wide and intimidating junction. The subways should be abandoned and replaced with surface crossings. The problem with this route is the woeful maintenance of hedges by WHBC reducing the effective width of the route, only recently fixed after months of campaigning by us. 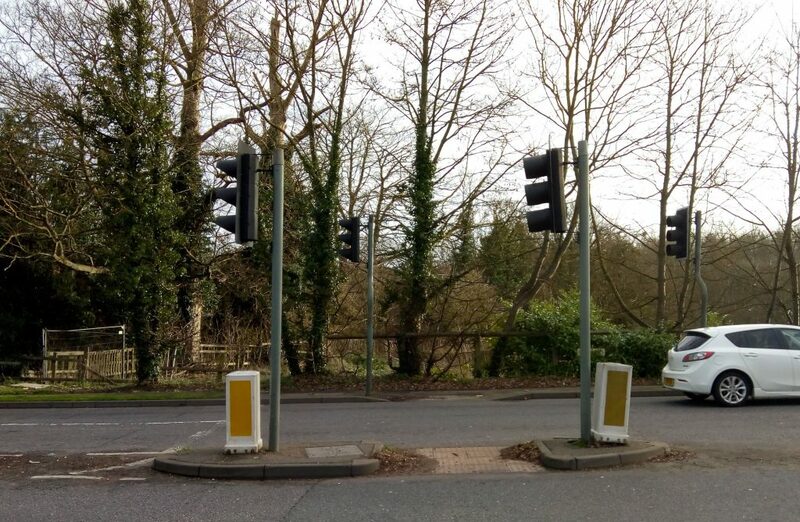 We support the provision of a signalised crossing of the entrance to Beaconsfield Road. This junction needs narrowing and the corners tightening as we find turning traffic travels at speed and drivers signal late putting walkers and cyclists at risk. A solution is required for the link from French Horn Lane to Old Hatfield. This could easily be done via the Batterdale subway if HCC were prepared to accept a reduced height standard. (We note the 4ft6 high under rail bridge in Bedford as proof this can be done.) The current cycle route 12 via the Great North Road roundabout is of no use to anyone except the most expert cyclist. We support downgrading the road to a single carriageway and a reduction in the speed limit to 30mph. 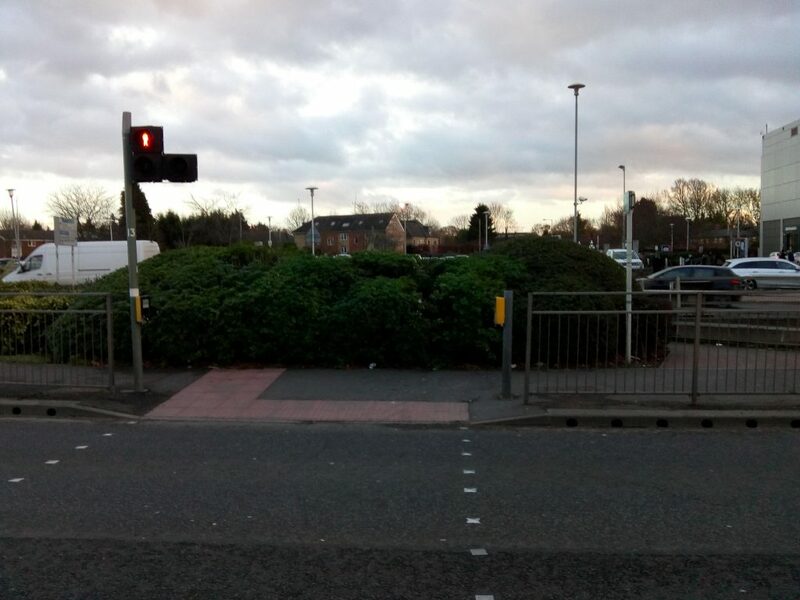 The junction at the north end of the Galleria needs work to remove bushes which block the route to St Albans Road West on the east side of Comet Way. The cycle path across the north of the Galleria has been in part removed and should be put back, widened and linked directly to the junction. The large subway should be abandoned. 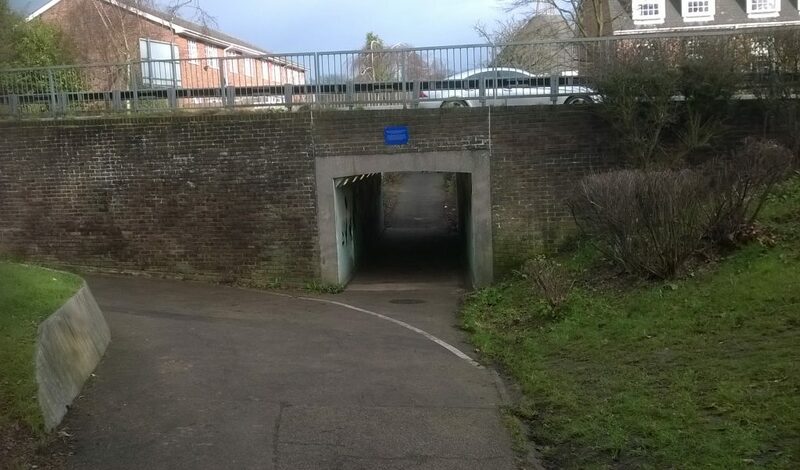 It contains gutters across the cycle path which are a hazard and is normally full of glass and graffiti making it an intimidating route no one wishes to use. North west of Hatfield Garden Village there is Great Braitch Lane (shown on the map). This is a very poor route with no dipped kerbs at either end and gates, which means it is only open to able bodied cyclists. Disabled cyclists and families are effectively banned. This then comes out on to Coopers Green Lane at a bad crossing with no speed limit. The continuation on to Stanboroughbury Farm is a badly surfaced track, unsuitable for many types of bicycle. Housing in this area should fund improvements on this axis. When the housing is built north west of Hatfield, there needs to be a cycling and walking bridge over the A1(M) and A1001 connecting the new housing to the Homestead Road/Ground Lane axis to Hatfield Station, as proposed in the Hatfield 2030+ strategy. North of Birchwood there is a problem with trucks using the entrance to the former HCC weighbridge as overnight parking and blocking the cycle route. There need to be clear marking that this is illegal and/or barriers to prevent this. There is no connectivity of cycle routes from Tesco to Mount Pleasant (see below). The existing wide footways south of Tesco should be made legal for cycling. They were constructed as cycle paths but never legally made so. 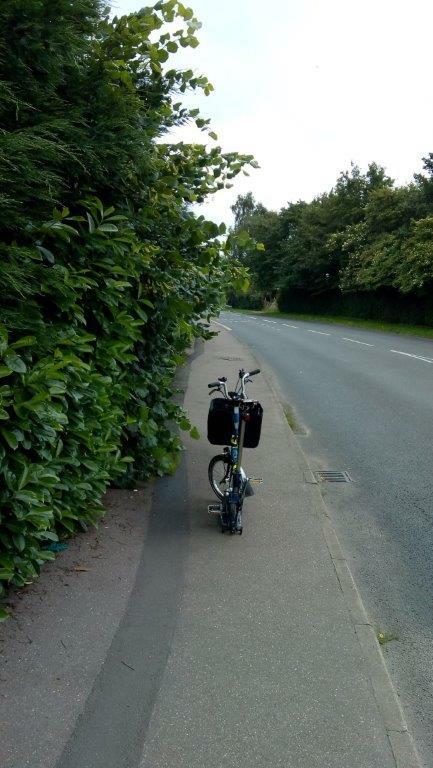 The photo shows the route to Tesco is not a cycle path. The junction of the A414 and Great North Road should be signalised with a single walking and cycling phase across the Great North Road and the access road to Tesco. The Airfield Roundabout needs urgent work as the cycle path crosses Wellfield Road and Birchwood Ave at informal crossings. Cars come off the roundabout at speed signalling late making this a very dangerous crossing. Light controlled crossings are needed for walkers and cyclists. We assume this is proposed as part of works to signalise this junction? Please confirm. We support redesigning the links to the Alban Way. It is impossible for disabled riders and families with child trailers to access the Alban Way via the ramp because of the barriers on it. The anti-bicycle barriers should be removed and the gradient reduced. We support an off-road cycle path along St Albans Road East and the widening of the railway bridge to accommodate this. The A414 plan should consider a second entrance to Hatfield station at this point which would bring the residents of Birchwood and The Ryde 5 minutes closer to the station (as the long walk around to the current entrance would be avoided). This could then connect to planned housing north west of Hatfield, via the Ground Lane axis and a bridge over the A1(M). Please can this be planned as an integrated part of the project? At the Red Lion junction (photo) cyclists are recommended to dismount to cross the A1001. This discriminates against disabled cyclists and children in trailers unable to do so. How are they expected to cross this junction? Cyclist dismount: What if you are disabled and cannot? At the northern exit from Old Hatfield, national cycle route 12 crosses the A1001 on the flat. At peak times it is dangerous to cross here give traffic volumes. This leads to illegal cycling on the east side pavement. A light controlled crossing or at least a zebra is needed. We support measures to improve the A1000-A414 junction. On the south side traffic heading west comes off the A1000 at speed and often signalling late. This arm of the junction needs tightening to force traffic to slow and/or a light controlled crossing. At the north side of the junction there should be a cycling and walking phase to link the cycle route to Mill Green via the existing bridleway and then on to the cycle path next to the A414. Connectivity here is poor. This would also enable the cycle route to cross the A1000 at this point rather than the nasty island half a mile to the north which as an informal crossing simply does not work at peak periods unless cars stop to let people cross. We support raised entry treatments along the Great North Way. There is a plan for a short section of cycle path west from the A1000 at this point which we have seen detailed plans for and commented on. This should extend parallel with the A414 over the railway to Tesco to link to the A1001 route to Stanborough and WGC, to encourage cycling from The Ryde estate to Tesco and Stanborough School. We support the development of an off-road cycle route from Stanborough to St Albans along Coopers Green Lane, alongside much needed reductions in speed limits. Average speed cameras will be needed to enforce this. The roundabouts at Stanborough where the A6129 meets the B197 and B653 need signalised crossings for walkers and cyclists. We therefore support signalisation at this point. 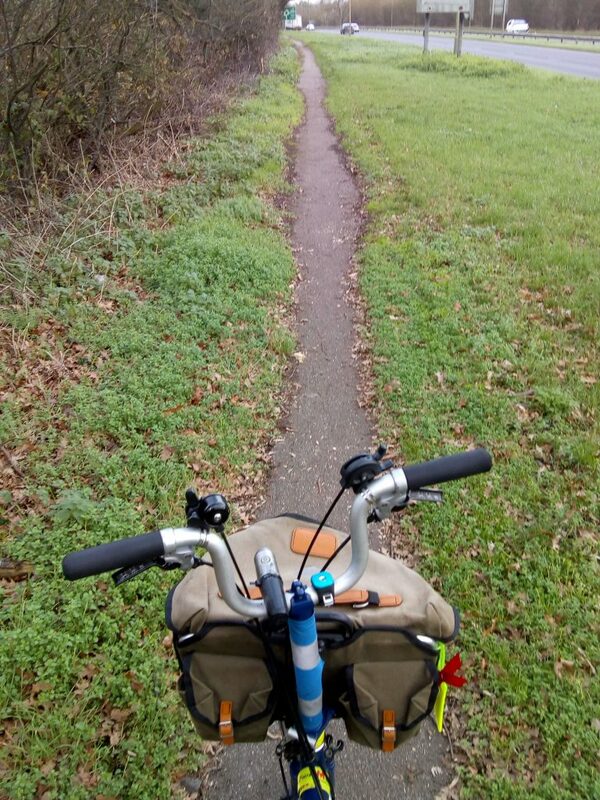 There should be off-road cycle paths alongside the B653 to Wheathampstead and alongside the B197 to Lemsford linking to an off-road cycle route from Lemsford up Valley Road into WGC. These routes would encourage cycling to and from Stanborough School and the town centre. Old Stanborough Lane, which forms the cycle route parallel to the A6129, is unlit for half its length (lakes to Police HQ entrance), badly surfaced and badly maintained, with hedges encroaching onto the path. Yet it is also a route used by the Stanborough School children who live in north Hatfield. The road side hedge should be cut back to be a low barrier between the road and path to make the path more visible, with lighting on the main road being improved to illuminate the cycling and walking route. Overall many parts of WGC have poor cycling provision and lack of connectivity to the town centre and station. This will impact on any provision along the corridor if local cyclists cannot safely access the routes along the A414. Comments on the A6129 are in the previous section. A414 /A1000 junction comments are in the previous section. We support plans to improve the cycle path alongside the A1000. A particular concern is the poor crossing south of Ascots Lane where the cycle path changes sides. This is almost unusable at peak times as walkers and cyclists are dependent on car drivers stopping. Few do. It should be replaced by a signalised crossing at the A414 junction at Mill Green and the cycle path moved to the east side of the A1000 from Ascots Lane to Mill Green, not least as this then improves connectivity for the village, museum and the cycle path to Gypsy Lane. The Ascots Lane junction needs narrowing and tightening to reduce vehicle speeds. Hedges need cutting back to improve sight lines, especially for north bound cyclists. The section of path north to Twentieth Mile bridge suffers from tree roots. Wooden safety barriers have rotted away and not been replaced. The surface on the road side of the path is poor. 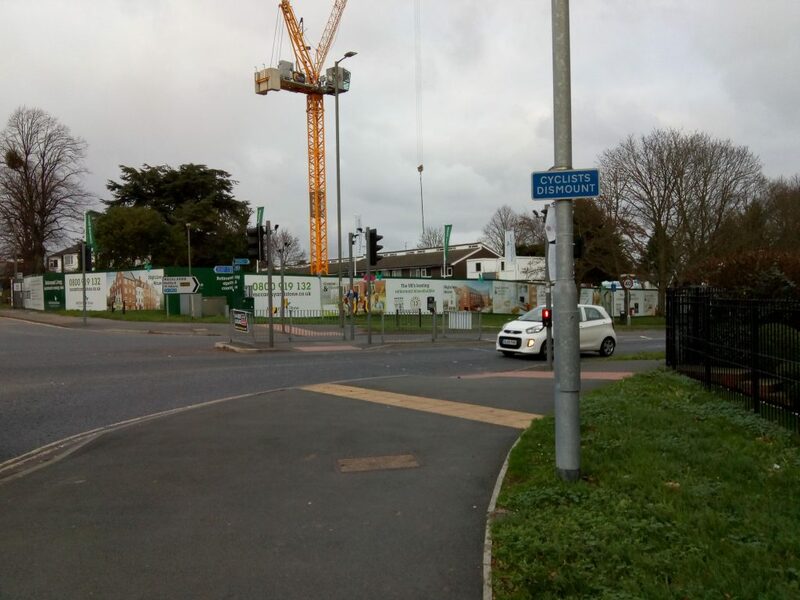 We support the provision of a cycle route on Bridge Road to the town centre but are concerned that it should connect through to the WHBC offices, Oaklands College, Campus West and National Route 12 with cyclable links to shops and station. The Campus gyratory is a terrible barrier to safe cycling in the town centre, right outside the local council offices. There needs to be an off-road cycle route alongside the A414 towards Hertford. At Mill Green this needs to connect across the light-controlled junction of the A1000 and A414 and then via the bridleway to Mill Green. At Gypsy lane there is an at grade north-south foot crossing of the A414. This is completely useless as a safe crossing of a 70 mph road. A bridge is required here. This would open up the rural area east of Hatfield house to access for WGC residents. The existing path to Gypsy Lane should be extended to the subway at Cole Green. The local landowners (Lafarge and Gascoyne Cecil Estates) are open to this idea. We assume this off road route could run via Birchall Garden Suburb if constructed. There is no safe cycling route across the A414 between Mill Green and Cole Green towards Essendon. A light controlled or bridge crossing of the A414 at the junction with the B1455 is required to enable Essendon residents to benefit from active travel to Hertford, Hatfield and WGC. Works on the B158 will be needed to facilitate this. If it is not possible to create a route parallel to the A414, a route through west WGC should be provided along a Mill Green – QE2 – Beehive – Great Gannet axis using a combination of off-road paths, 20 mph limits and parallel access roads alongside the main roads. Works beyond Cole Green are covered in the section below. A414 Mill Green to Cole Green are in the section above. 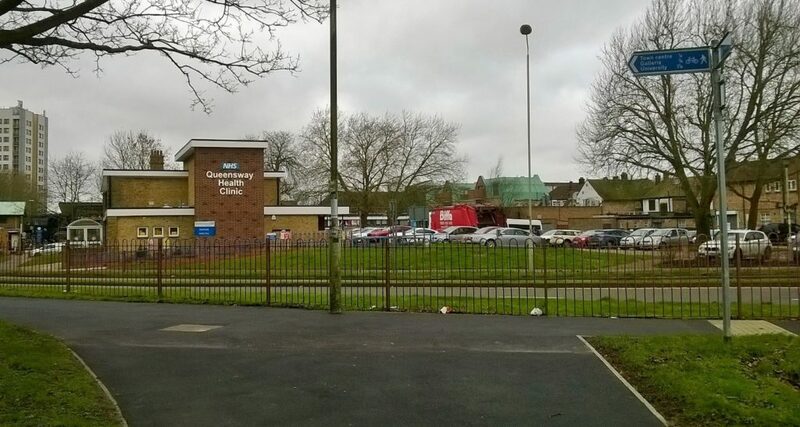 When housing is developed east of WGC, there should be a bridge over the A414 at the Cole Green roundabout to connect the estate to Cole Green village directly to encourage access to the new school. The Cole Green Way is unlit and isolated. The surface is very poor and muddy preventing all year use for commuters. We are aware of plans (unfunded) to address the surfacing in part but not lighting. The hill over the waste tip south of the B195 is a further barrier to some cyclists. This could be replaced with a route through the planned new housing beside the B195. The subway under the A414 is prone to flooding. The surface at Hertford Football club is awful. If the club cannot fund a decent surface, at the very least parked cars should be kept off the smoother surface at the east side of the site. The immediate entry in to Hertford at the junction of Castle St with Parliament Square is inadequate as traffic turns off the roundabout at speed and with late signalling. This makes this junction challenging for cyclists. The poor road surface on Fore Street needs work to make it fit for purpose. An alternative route exists via the Old Coach Road (formerly the A414) but this is unlit. There is no off-road cycle path alongside the A414 from Hertingfordbury to Hertford to extend the Old Coach Road route in to the town. Given an improved surface to the Cole Green Way and lighting on one of the routes, all year commuting between the towns becomes viable. At present it is not. This strikes us as a very 1970s solution to traffic problems and will simply move the congestion on to other locations and encourage growth in car use as all such developments do. We expect that the road will be full as soon as it opens. A real move to active travel in Hertford and other towns and a real improvement to public transport should be implemented before this road is built. It is surely better to reduce demand rather than destroying more of our countryside to encourage even more car dependency?